Baked Salmon with a Creamy Mustard Sauce. 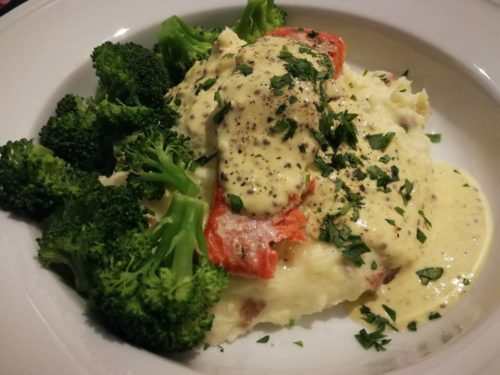 One of my favorite, simple, and elegant dishes for a dinner party is baked wild salmon draped with a decadent creamy mustard sauce and garnished with fresh herbs. Your guests will love it, too! This is a very simple recipe to prepare as long as you have an oven. 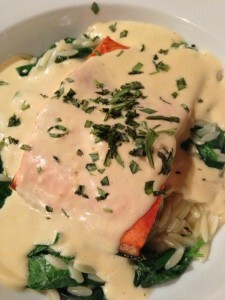 Try my Baked Salmon with a Creamy Mustard Sauce tonight! 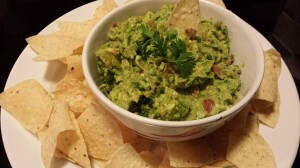 It’s a super easy dish that returns to my dinner menus often. 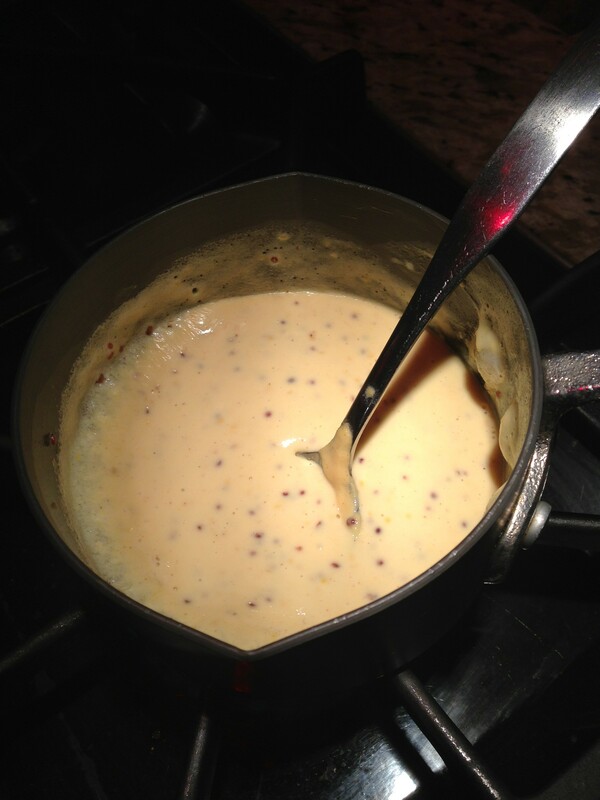 Pair the mustard cream sauce with any fish or even beef or chicken! 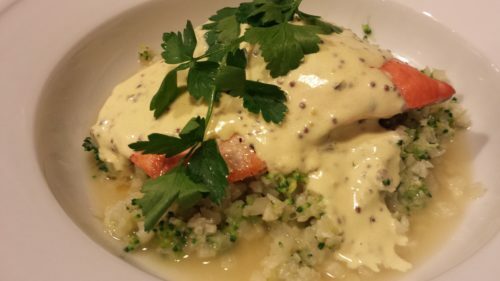 Try mys baked salmon with creamy mustard sauce over broccoli cauliflower rice or your favorite cooked vegetables. 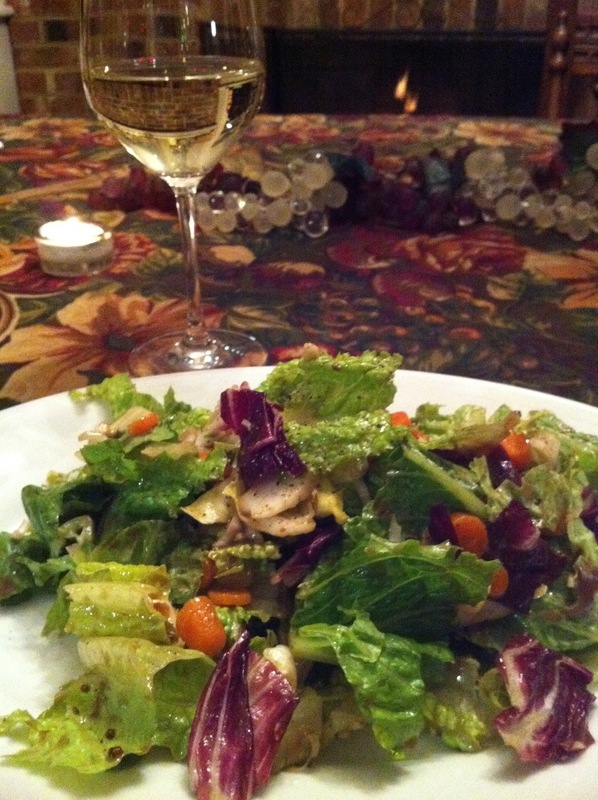 Or try it over a saute of green beans and sliced mushrooms. From the kitchen of A Food Lover’s Delight…….. This recipe also works with a flaky white fish fillet. 2. Line the baking sheet with the parchment paper. This will provide a speedy clean-up later. 3. Place the salmon fillets skin-side-down on the parchment paper-lined baking sheet. 4. Bake the salmon fillets on the center rack of the oven at 400 degrees for 10 to 15 minutes depending on your preference for doneness. 10 minutes will give a darker pink center and 15 minutes is closer to a well-done light pink. 5. While the salmon is baking, combine the cream and the mustard in a small saucepan. Stir over low heat until the sauce is warmed-through and has thickened slightly. 6. When the salmon is done, take it out of the oven. 7. Remove the fillets from the parchment paper with a spatula and place on dinner plates. The salmon flesh may slide right off the skin when removed from the pan but that’s ok as long as you try to keep each fillet in one piece. 8. 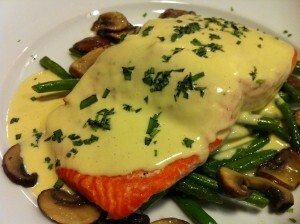 Spoon the mustard cream sauce over each salmon fillet. 9. Sprinkle the tarragon (or chives or parsley) over the sauced salmon fillets. Serves 4 as a main or fish course. Variations: I generally serve the salmon over a vegetable medley of sauteed French green beans, shallots and mushrooms tossed in a butter sauce. If you prefer, serve sauteed vegetables on the side. You could also serve over broccoli and cauliflower rice (buy these riced veggies at Trader Joe’s) or my Easy Mashed Potatoes. You can also enjoy the salmon with a side salad of sliced tomatoes, a nice vinaigrette, and whatever herb you are using for garnish. Wild or basmati rice is also a side dish option if you are serving a separate salad course.